After six weeks broadcasting from a portable building in the grounds of the Memorial car park, FromeFM returns to its home at the new and improved Old Fire Station on Christchurch Street West. Two entirely separate studios have been made from the space, with FromeFM having one and Luke Manning will move his graphic design company Pencil Studio from the Old Church School into the newly refurbished upstairs studio. The much loved Old Fire Station has had an interesting history. Although there had been a fire service in Frome since 1773, plans for the ‘new’ fire station, as it was then known, were put forward with enough space for two engines. It was finally completed 1895 at a cost of £220. 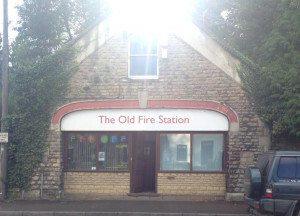 Closed to fire engines in 1970, the ambulance service then used the building until it came into private ownership with FromeFM moving in in 2008. Completely refurbished, the space should now provide a comfortable home to broadcast from for years to come.